When I drove charter for Lebanon Bus Co., my regular coach was an MC-9 purchased used from a dealer that was a branch of Frank Martz. Had a nice new paint job that was simply the Martz livery without the name. Try explaining that to a picket line when your group is staying across the street from their Scranton terminal. I invited one of the strikers to check it out. As soon as he saw the seat covers he knew it was ex-Greyhound. No problem. It's the evening of March 3rd. 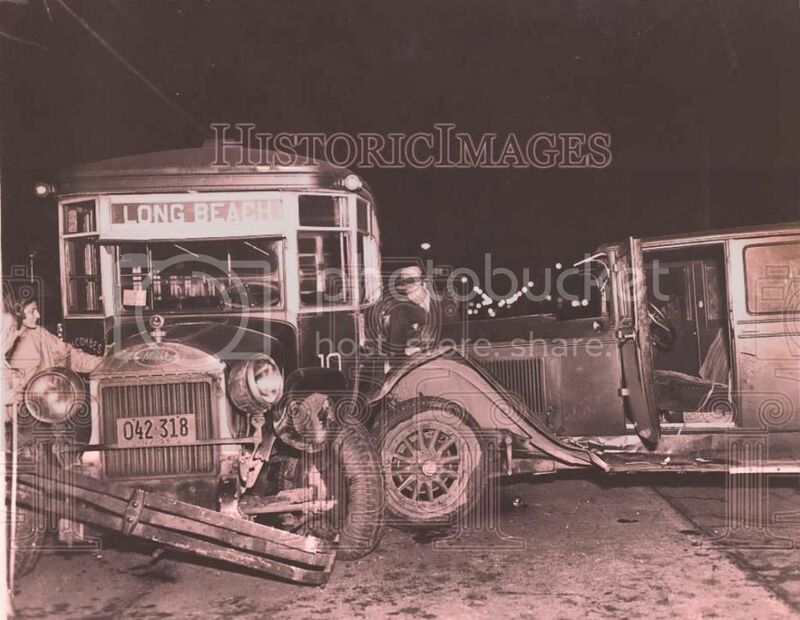 1935 as we see the aftermath of an accident in front of the Roadside Rest (Frankfurters & Seafood at the time) on Long Beach Road in Oceanside in which a car has T boned a bus resulting in moderate damage to both vehicles but no serious personal injuries. 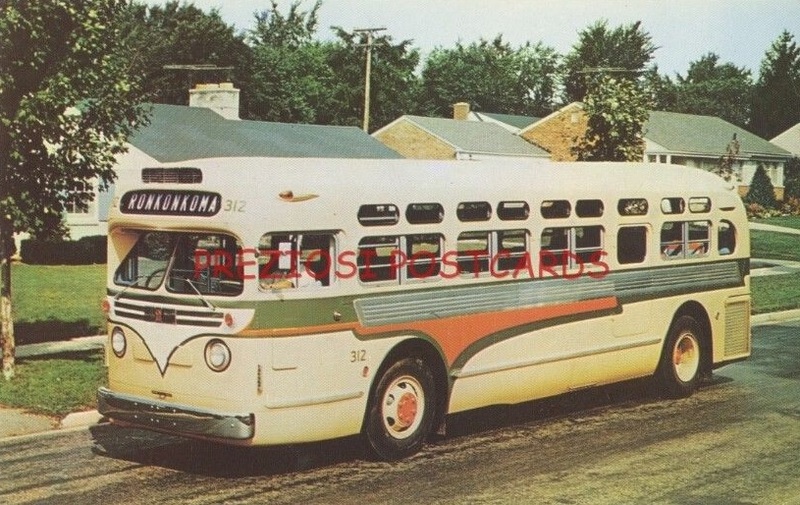 The coach, a mid twenties 25 passenger Mack modeled as an 'AB' and carrying fleet #10, was owned by H. Combes of Long Beach Bus Company and was traveling south to Long Beach on its run from Hempstead (this route was later sold to Bee Line affiliate Rockville Centre Bus Corporation). Note that #10 displays an 'Omnibus' license plate dated 1935 - the Omnibus registration is evidenced by the letter 'O' at the beginning of the number series. Photo courtesy of 'HistoricImages-store' and is available at eBay as item # 377195779883. 19xx Ford Transit Model 29B: ?? Schenck Transportation Company/Schenck Tours Inc.
Universal Auto Bus Service Corp.
1940 Yellow Coach GM TG2101: ?? Mack Brothers Transportation Co., Inc.
1947 Chevrolet Model D: ????-???? WCA - Not being familiar with the history of Oceanside, did the Roadside Rest location morph into Nathan's before it was torn down for shopping center? It sure did and that was the beginning of the end of an era. I want you to know that at its height the Roadside Rest was almost a national institution with star studded entertainers including the likes of Frank Sinatra and Tony Bennett as regulars on its cabaret stage. To coin a phrase from Mr. Sinatra's 'High Hopes' lyric; "oops, there goes another rubber tree plant"
Best regards and Happy Chanukah. Ironic that you quoted "Old Blue Eyes" on what would have bbeen his 99th birthday. Info thanks to Railbus63's great find of a comprehensive listing of later GM PG's and PD's. S-60 To Smith Haven Mall,, I think, at least for posterity, we should see a live sample of what we're talking about when we find one. 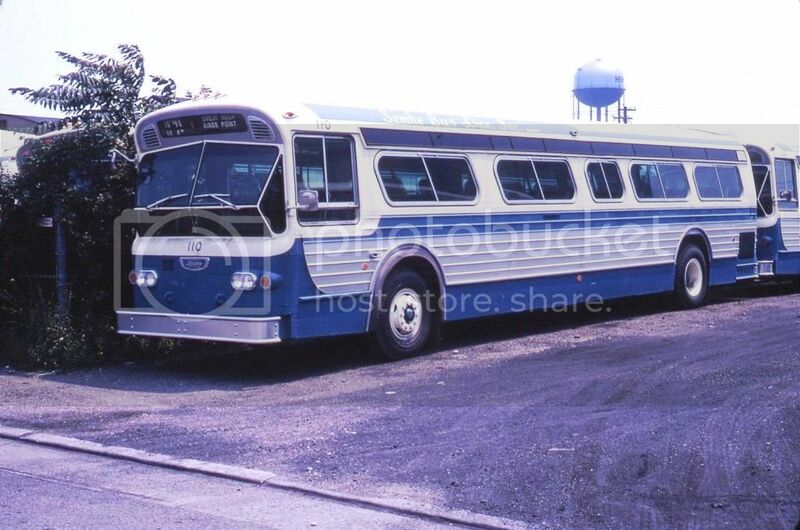 Seen sometime in 1970 at its company yard in Hempstead is fleet #110 - a 1970 51 passenger Flxible modeled as a 111CD-D5-1 and one of six likenesses numbered between 110 and 115 purchased by the County of Nassau and delivered to Semke Bus Line in that company's livery. It was a time in the history of bus transportation throughout the State of New York in which municipalities took over most private companies while allowing them by contract to continue operation carrying their own flags - this came to an end in Nassau County in 1973 when the Metropolitan Transportation Authority became sole operator. In addition to the Semke purchase, the county bought twenty nine 111CD's with 20 to Hempstead Bus Corporation, 6 to Mid Island Transportation and 3 to Universal Auto Bus. #110's last run of the day was to Kings Point which was and still is a very affluent bedroom community along the Long Island Sound shoreline just outside Great Neck. Semke, established in 1918, served the Village of Hempstead (L.I.) and its environs for over a half century until it was absorbed by Hempstead Bus Corporation in 1970. The company was a 'mom and pop' operation in the truest sense of the word and, in fact, Mr. and Mrs. Semke, then newly married, actually traveled to Pontiac, Michigan to pick up their brand new bus with a stop on their way home to see the 1933/34 Chicago Century of Progress Exposition as part of their extended honeymoon. Photo courtesy of '90mac' and is available at eBay as item # 381165865862. I definitely remember when Nassau County purchased a fleet of 1970 Flxibles for lease to its various private operators. However, to the best of my knowledge neither the Semke nor Hempstead firms had routes that extended to Kings Point, despite the roll sign indication. A small operator, Universal Bus, served Great Neck and Kings Point; it in turn was absorbed by Schenck Transportation sometime around 1971. The bus shown was probably equipped with roll signs for all Nassau County routes in case the County wanted to transfer a particular bus from one operator to another. Note that the right side route indicator is turned to N40 and N41 (a Hempstead Bus route) while the left side indicator says Great Neck-Kings Point (a Universal/Schenck route). Numbers 111 and 112 were delivered in September, 1956. Found for sale on Ebay two photos of two Grumman Flxible 53102-8-1, both has the sign up for the N16. The impending sale of Chemical Bank to Chase may have motivated my taking the photo below, but of course I had to await a bus to make this Seaford shot more interesting. 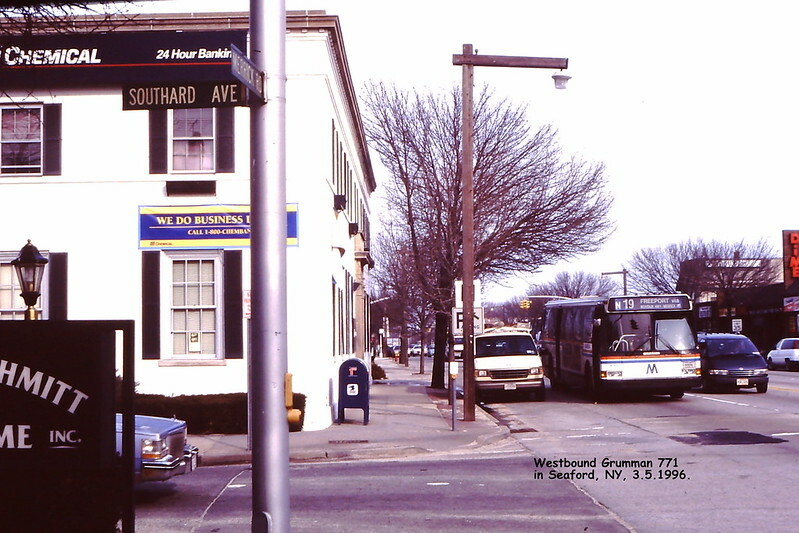 At one point in Seaford history, the bank building was a funeral home owned by Mary Southard, of the family that owned property north of Merrick Road.